October 21, 2011 by Alphageek in "alphageek", "review", "urbanspoon"
10/20/2011 This was a quick stop after a meeting. A coworker said this was the best Mexican food he has ever had, anywhere in the United States. End of discussion. I took him up on the offer to stop by and see what the fuss was all about. We have been throwing the term best around here quite a bit lately, so this place will need to measure up to make the grade. A quick glance at the menu showed some interesting items. One could go with the usual enchiladas or burritos, but that would not be alphageek style. I settled on some fish tacos. Yes, I know that sounds simple, but this is supposed to be a short, hard hitting review. We had the obligatory chips and salsa. I heard the chips and salsa were supposed to be the best ever. The chips were certainly better than average, and did not taste like they came out of a bag from the grocery store down the street. The salsa was spectacular. It tasted as if it were made that day, with an excellent roasted pepper taste that provided the right amount of kick. My fish tacos arrived quickly. I have to say the service was impressive. The service was more impressive than my photo. Yes, I had to use my cell phone, and I apologize. Please do not strike any alaphageek points for not having a better camera with me. The fish was perfectly grilled. The cabbage and other ingredients were exceptionally fresh tasting. Even the tortillas are made on site daily, as one can see when waiting to be seated. There were some beans on the side, which included roasted tomatoes, again with just the right amount of zing from hot peppers. Personally, the avocado sauce was nothing special, but the alphageek is not a big avocado guy. 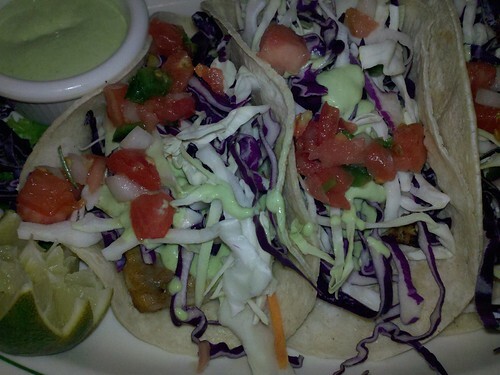 The fish tacos made for a great meal and were certainly better than run of the mill food. So, is this the best ever? Well, my coworker says it is. Me? It certainly was the best Mexican food I have had in a while. I can't say best ever, but I will take Mrs. Alphageek sometime, and let her judge.